News outlets are reporting that, before resigning office later today, Governor Greitens has signed 77 bills passed by the Missouri General Assembly this legislative session. Full list of bills signed at KY3. The governor has now signed two bills we have been tracking this session; another important issue doesn't require governor's approval; two more bills still await the governor's signature. SB 757 (Support) - Adding Franklin County To Bi-state Development Agency - This allows Franklin County to join the regional public transportation system. SB 843 (Support) - Modifies the composition, duties or repeals outright certain administrative boards, commissions, and councils; of interest to us this creates the Missouri Route 66 Centennial Commission. Bicycle Route 66 in Missouri has recently been approved for addition to the U.S. National Bicycle Route system--and ribbon cutting will be June 17th in Joplin. 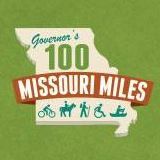 This has been a project MoDOT, the Missouri Bicycle & Pedestrian Federation, and many local supporters along Missouri Route 66, have been working on for the better part of a decade. Passage by both chambers of the General Assembly is sufficient to place the issue on the ballot; the Governor's approval is not required. However, the Governor can choose the timing of the vote--generally either the November or August election. The General Assembly set the vote for the November election and as far as I know the governor has not (yet) changed the timing. More details about the fuel tax increase that will be on the ballot for a popular vote later this year, including the impact of the fuel tax proposal on Missouri bicycling, walking, trails, and public transportation. SB 659 (Support) - Accountability reporting for state parks (but NO special callout for new park acquisition or donations). 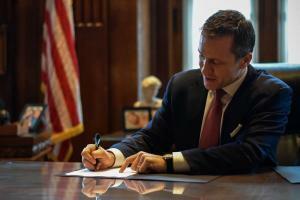 Governor Eric Greitens signed 77 bills today. The General Assembly passed 145 bills this year--far more than the 69 bills passed in 2017. SB 782 (Neutral) - Requirement for State Parks to provide fencing along Rock Island Corridor (Sen. Kehoe). These bills will be left for Governor Parson to sign or not sign. Full list of bills on our 2018 Legislative Agenda - including those that made some progress in 2018 but were not passed and sent to the Governor, and those that we opposed and that were defeated. Building a world class bicycle and pedestrian transportation network across Missouri, improving road safety for all users, encouraging more people to walk and bicycle more often, and building a statewide movement in support of bicycling, walking, and trails are the four primary goals of MoBikeFed's Vision for Bicycling and Walking in Missouri. Our legislative work with the Missouri General Assembly is one of the most important ways that we accomplish all four of those goals. The progress we make--and the disasters we avert--at the statewide level affect every community and neighborhood across Missouri. 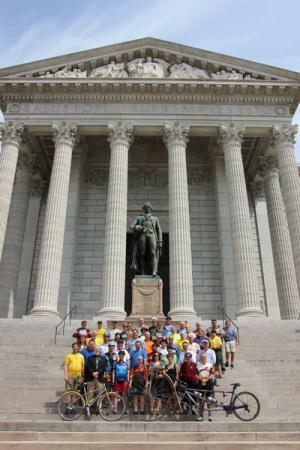 Your ongoing membership and generous financial support help make our legislative work in Jefferson City and in Washington DC as effective as it can be--and help turn our Vision into reality! « Previous story: Missouri House & Senate put 10-cent fuel tax increase on the ballot - How will this affect people who walk, bicycle, use public transit?